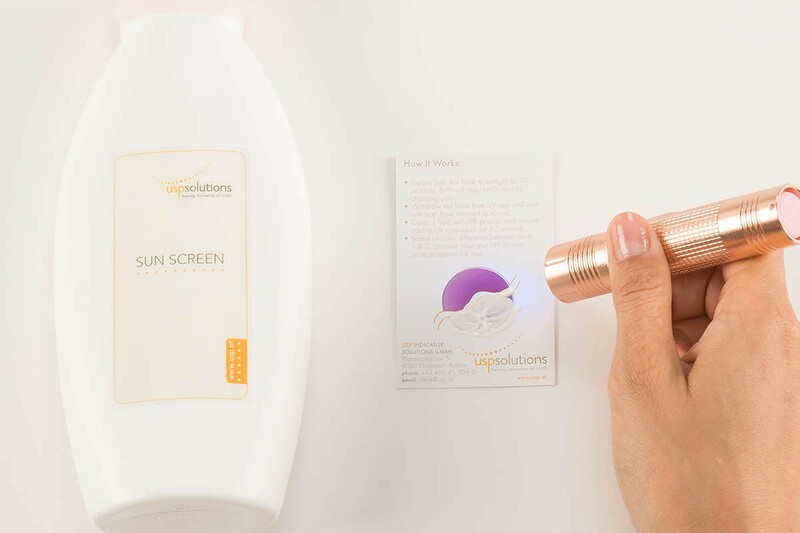 How effective is your UV product? 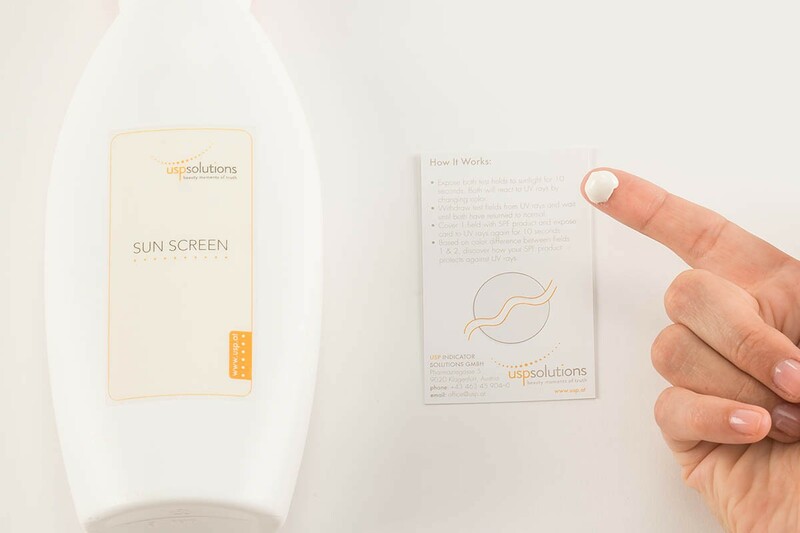 USP Solutions’ UV Efficacy Demo Tool is a reliable and easy-to-use test which appeals to your consumer’s senses, enabling them to touch and feel your brand, thus emotionally engaging them. The UV Efficacy Demo Tool test area reacts with a color change when exposed to UV radiation within seconds. The more extreme the color change, the higher the UV intensity level. 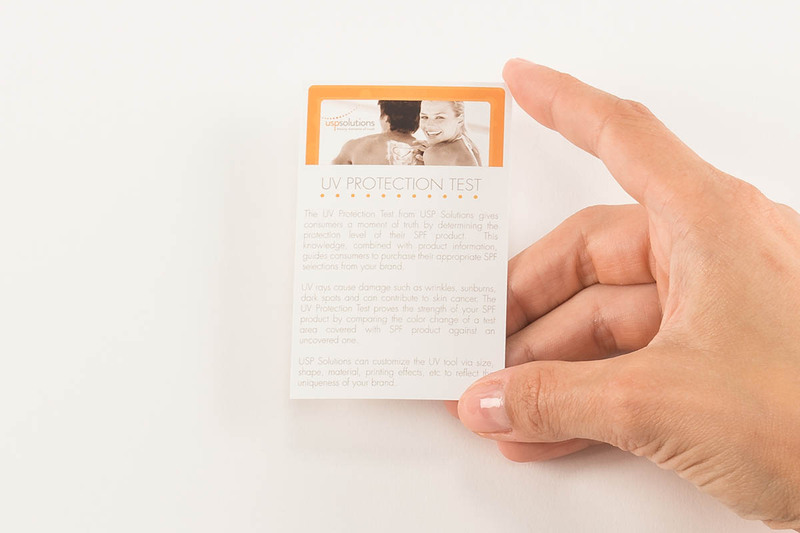 When comparing the color change of a test area covered with a SPF product against one that is not covered; the protection strength of the product can be proven. 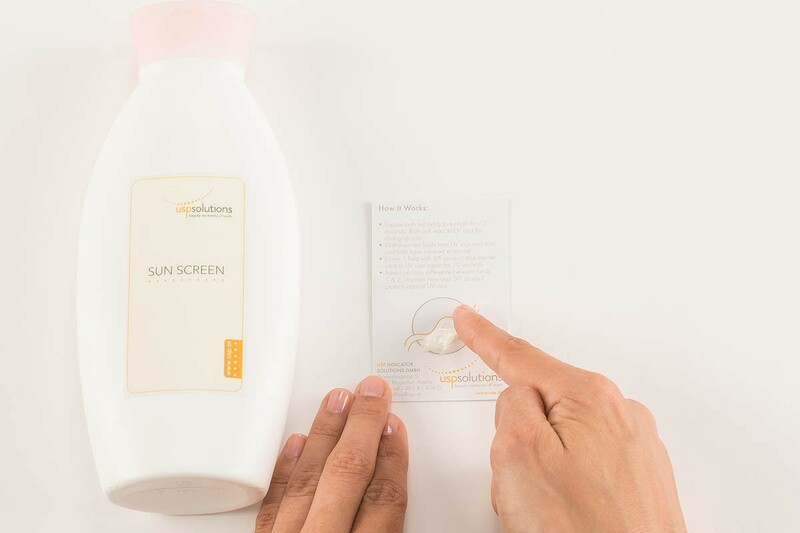 When consumers realize how effectively your product protects them against harmful UV rays, they experience an “A-ha” moment. This emotional experience is also referred to as “Beauty Moment of Truth”. 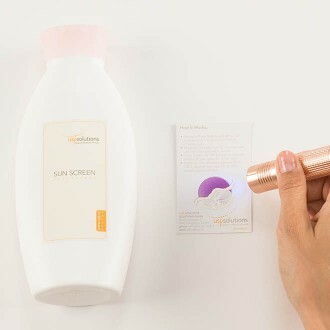 The UV Efficacy Demo Tool creates an engaging consumer experience. Furthermore, it guides them to the right product choice, which is essential when it comes to brand trust and brand loyalty. Most sun care brands offer a wide variety of product choice, each with a different sun protection factor suitable for various levels of UV radiation Consumers, however, are often unsure about their sun care needs. 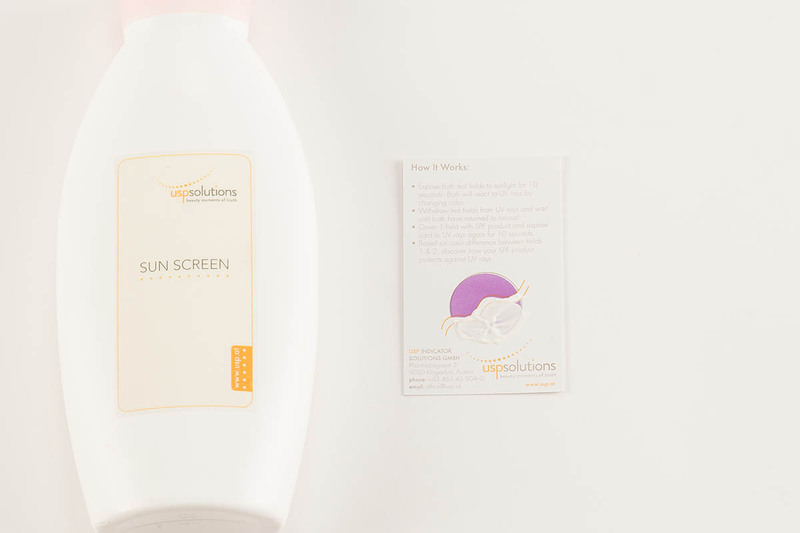 Customers are often overwhelmed by the great variety of sun care products available. 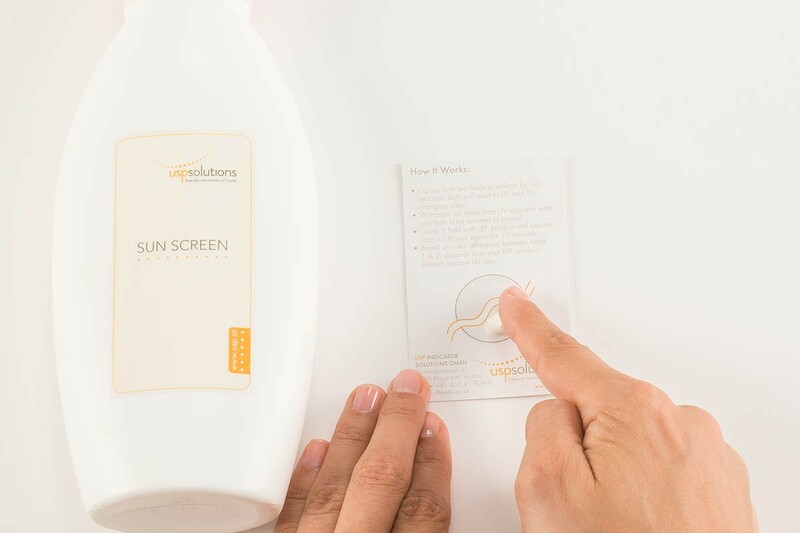 Uncertain about their daily sun care needs, they find it difficult to choose “the one”. More importantly, how can they know if the product delivers what it promises? 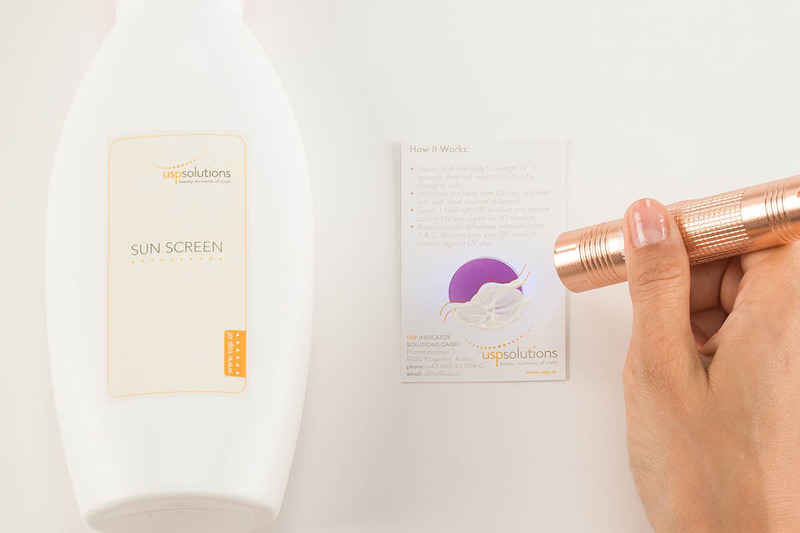 What is the efficacy of this sun product like? Which sun protection do I need? Which UV filter is right and works best? We provide Marketing Executives like yourself with multisensory Brand Activation Tools, which enable consumers to experience a brand throughout various channels. 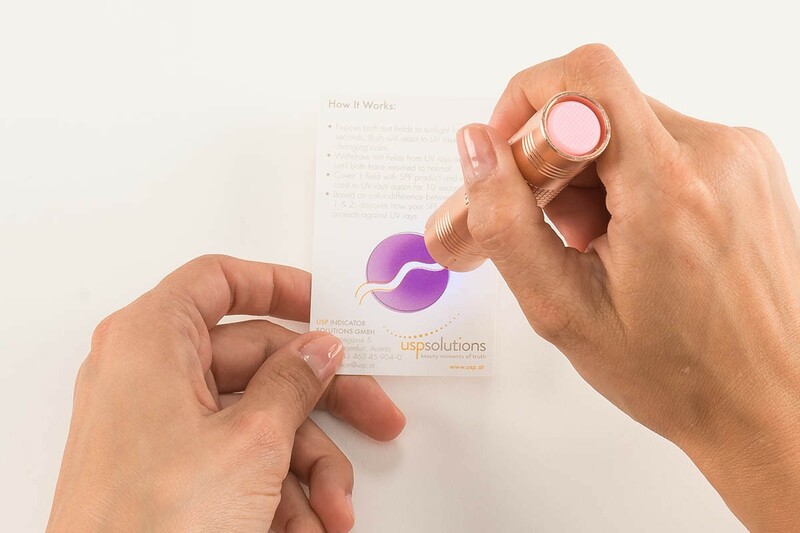 The USP Solutions UV Efficacy Demo Tool enables your cosmetics brand to design an emotionally engaging and tailor-made “Beauty Moment of Truth”. Place Efficacy Card in front of you. 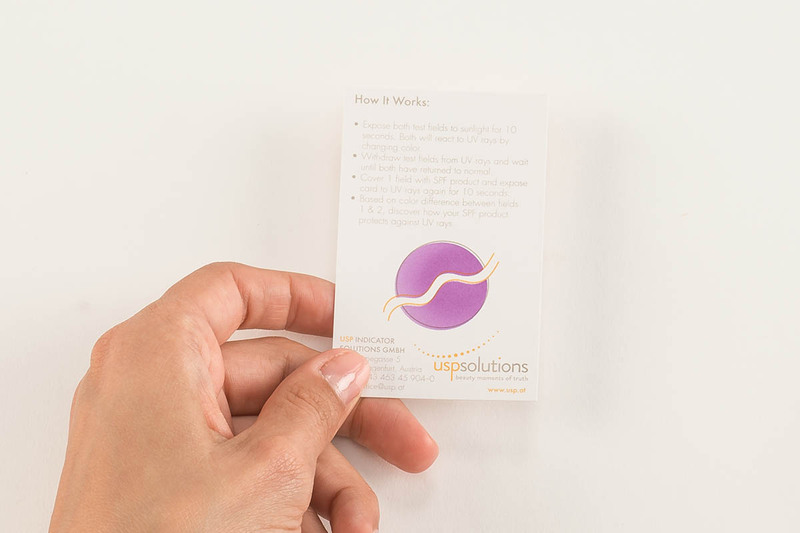 Expose test area to sun or UV lamp for about 10 seconds, both test fields will react to ultraviolet rays and change color. 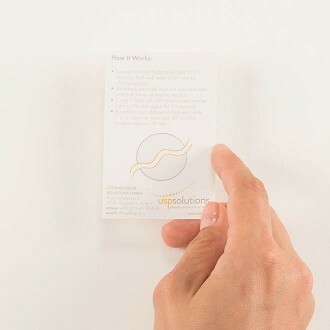 Withdraw from sun- or UV lamp and wait until test fields recover and change back to white color. 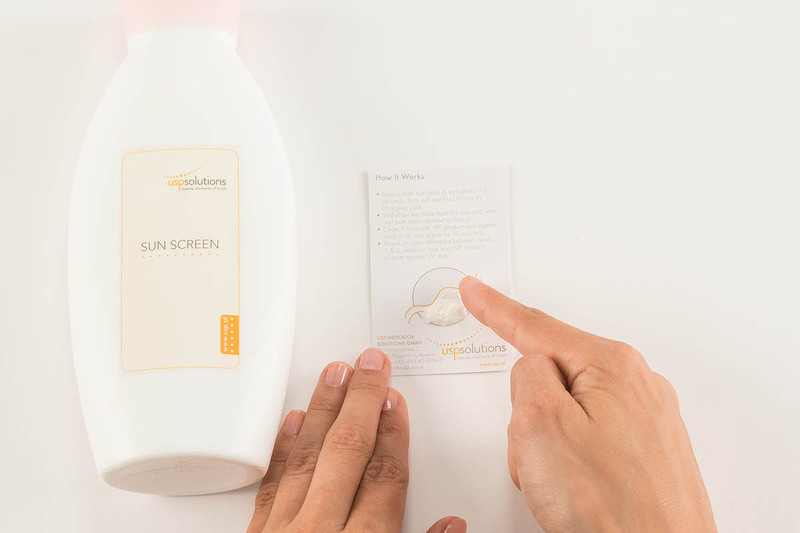 As a next step apply sun protection product onto one half of the test area. Expose to UV light (sun or UV lamp) again. See how the unprotected area turns purple whereas the test field with sun protection does not show any color change. This test shows how effective your product protects against UV rays. 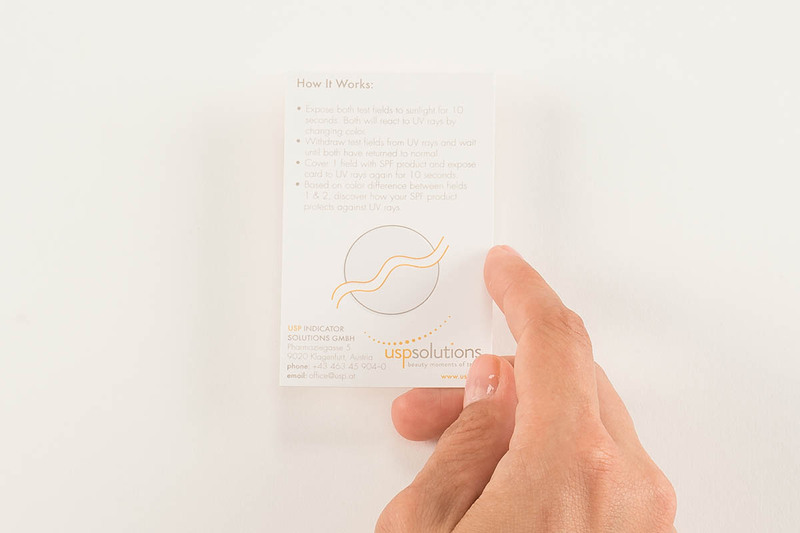 We can easily customize UV Efficacy Demo Tool and adjust size, shape, material, printing effects and more – so the tool perfectly reflects the uniqueness of your brand.